Much ink and pixels have been spilled upon how the US became so dependent upon petroleum to move ourselves around. I've been looking around, thinking about my behavior and that of others. So far, the rising cost of gasoline has affected my family very little because of our housing choice, a townhouse close to a major employment center and a commercial district. Why are there so few places like this in the US? Witold Rybczynski tried to explain in his book, City Life: Urban expectations in the new world. It's a very thought provoking book and I won't attempt to paraphrase it here. By the end of the book, I learned that Rybczynski and I both choose to live in former streetcar suburbs outside of major cities. It is a pleasant middle ground that is not readily available to other Americans, both because of their rarity in new metropolitan areas and because they are relatively expensive compared to newer suburbs. After investigation, he found no great conspiracies. People just preferred the independence of driving private automobiles over riding streetcars. People say we are lucky to live so close to work and to have such a convenient bus line. (It runs every 20-30 minutes and follows nearly the same route we would take if we drove ourselves.) Actually, luck had nothing to do with it. We made conscious choices with information that is available to everyone. After earning my PhD, I landed two job offers. One was 30 miles inland from Mark's job. The other was at Mark's workplace. The farther job would have ensured a long commute for at least one of us. When we found we could not afford a house that we liked in an area that we liked, we looked at townhouses. After bidding on 3, we finally won a bidding war (even though we were not the highest bidder). Iris finally shared that she did not cut her hair so short while attempting to trim off her split ends. 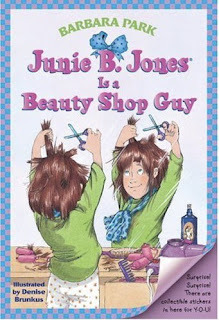 She was emulating June B. Jones in Junie B. Jones is a Beauty Shop Guy. I should have realized something was up when she agreed to and then reneged on the mommy and me haircuts at the "haircut store". First she said that she liked her hair long, then she agreed to just having her split ends trimmed. When I picked her up early from daycare on the agreed upon day, she threw a tantrum and said that she wasn't ready to cut her hair yet. She patiently watched and waited while my hair was cut. Suspiciously calm after a melt-down. She was planning it back then. I am so blind. The next weekend, when she went to a sleepover birthday party, another mom admired Iris' haircut and asked for the name of the salon. Mark notes that although people admire the nice wedge hairstyle she gave herself, no one has ever suggested that Iris cut their hair. * It is pointless. If the kids don't pick up slang from their parents, they will pick it up from each other in the school yard. Iris talks one way in the school, and another way around adults. She calls it "blending in". She says I should try it sometime. As luxury fashion has become more expensive, mainstream apparel has become markedly less so. Today, shoppers pay the same price for a basic Brooks Brothers men’s suit, $598, as they did in 1998. The suggested retail price of a pair of Levi’s 501 jeans, $46, is about $4 less than it was a decade ago. Dress for less and less confirmed my own observations. We, collectively, have too many clothes because clothes are too cheap. Look at the origin label on your clothes. They are made in faraway places you have never heard of. By the time you go back to the store for another t-shirt or pair of jeans, production will have moved to another country you have never heard of. It is not sustainable and some painful changes are on the way. The divergence of price extremes has become so striking that some fashion executives, including Mr. Konheim, are openly asking whether prices have reached both their nadir and apex at the same moment. “As far as bottom costs go, we’re there,” Mr. Konheim said. “I think we’ve exploited all the countries on earth for people who really want to work for nothing." Donnelly agrees with Kathleen, that producers in the US need to find niches away from basics (she calls them commodities) that change very little and slowly. Those can be produced easily abroad. She believes, as do I, that our domestic industry has to compete on the basis of quality and rapid response to customer needs. “Just like everyone else,” Mr. Donnelly said, “we’ve definitely had some cost increases and a lot of that has to do with transportation, for getting the goods from the manufacturers to our warehouses and off to the stores, as well as increases in the price of raw materials. Perhaps the high cost of energy will bring clothing producers and consumers closer geographically. Clothing locavores? The clothing industry will need to practice arms control. “Clothing has been incredibly cheap,” said Sarah Maxwell, a professor of marketing at Fordham University and the author of “The Price is Wrong” (Wiley, 2008), which looks at how price affects consumer behavior. Dress for Less and Less trots out the consumer price index fraud. The article quotes the official CPI, which says overall prices only moved up 32% between 1998 and 2008. Read Numbers racket: Why the economy is worse than we know by Kevin P. Phillips in the May issue of Harper's. Phillips dissects the CPI, one lie at a time. It's mandatory reading because we will be discussing it at the next tie-dye party/BBQ at our house. The tie-dye materials from Dharma Trading have arrived. Let's set a playdate in June. Email me with convenient times. If you ordered something, I will email you the cost for your portion of the order. My favorite neighborhood jacaranda tree. If you are in the south bay, drop by Isis between Rosecrans and 135th Street. Just spectacular. I feel like I cheated because I crossed latitudes and caught the tail end of jacaranda season in New Zealand and then again in Hawaii. 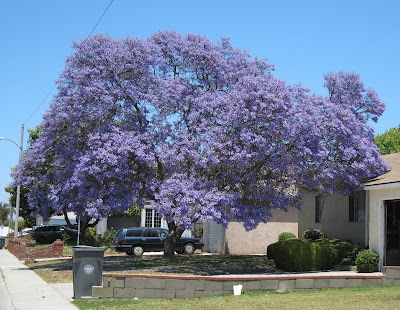 Three jacaranda seasons in one calendar year. I am rich. Last weekend, Iris learned that her mom used to work as a wardrobe mistress/chief dresser at an equity theater. What is a wardrobe mistress, she asked? Through the serendipitous nature of the internet and search engines, I learned that Martha Stewart has a wardrobe mistress and a blog! 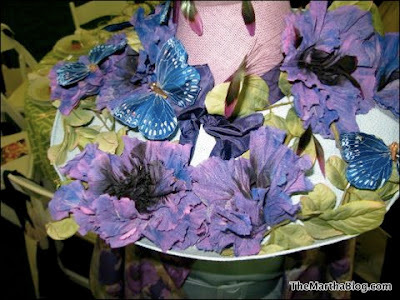 I loved the hats in the Come see hats, hats, and more great hats!! entry so much, I had to show you one. Follow the link to see a couple of dozen more fantastic hats. The blog is also delicious tongue in cheek fun. Learn another use for black Sharpies. Karena, my wardrobe mistress, painting the soles of my Louboutins black - I am not a fan of the signature red soles and always change the red to black - this is easy if you use a broad sharpie. Has any one else ever been sent to prison for carrying a Hermes Birkin bag? Did she have a wardrobe mistress during the trial? I know it is outside the scope of the wardrobe mistress' job, but someone should have stopped her before the mink scarf and Birkin bag incidents. Don't defense lawyers send their clients to wardrobe consultants? I am a hat person. Mark and I bought height extenders for our Billy bookcases so I could better show off my collection. Perhaps I will dust off a few of my favorites and photograph them for you. Come see hats, hats, and more great hats!! A Place to Hang Her Hats at home with Mimi Weddell, subject of of the documentary “Hats Off”. Hatfetish.com aka Berkeley Hat Company. A good source of finished hats and millinery supplies, back in my wardrobe mistress days. I took this photo in May 2006. She looked oddly mature in this photo. Compare with six months later. Her next Tae Kwon Do belt test is next week. Her instructor, Anton Kasabov, prides himself on not promoting kids assembly-line style. Kids have to earn their colors. 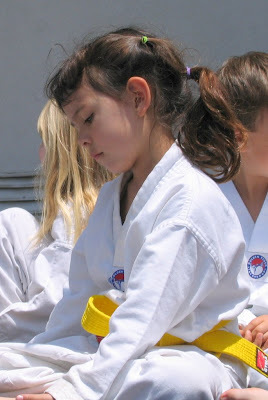 Last time, she did not pass the test to advance to purple belt. He says that she has been more focused since then and he has high hopes she will pass this time. There will be a demo in the park (scene of the video above) this Sunday followed by the annual potluck picnic. The actual belt test will be next Monday. Mark and I wonder, if we bring something awesome to the potluck, will that improve her chances of passing? A friend in Boulder alerted me to this story. Many people do not realize that the epicenter of the earthquake was in an area of eastern Tibet now administered under China's Sichuan province. This place is called "Aba Tibetan and Qiang Autonomous Prefecture" by the Chinese government, but "Aba" is actually "Ngaba" which is part of Amdo, the northeastern province of historical Tibet. The epicenter itself was in the Tibetan county of "Lungu" which the Chinese call "Wenchuan" and where, according to China's 2005 census information, at least 18.6% of the population is Tibetan. And while we have very little information about the impact of the earthquake on Tibetans because the areas around the epicenter remain cut off from the outside world, many fear the worst for thousands of Tibetans who remain detained or missing as a result of the crackdown. For instance, SFT has received unconfirmed but deeply distressing reports that many hundreds of Tibetans may have died when a large prison near Wenchuan collapsed. Official Chinese media has confirmed damage to a number of prisons in the area, but no detailed information has been released. The international community has rightly condemned the heinous efforts by the Burmese junta to block aid and relief to minority and dissident populations affected by the cyclone in Burma and must seek to prevent similar practices by Chinese authorities in Tibet. Of course, we are not seeing images of the damage in Tibet because journalists (the entire outside world) are banned in the region. In Boulder, I shared an apartment for a year with a graduate student studying the differences in disaster response and disaster reporting in the USA and USSR. You learn a great deal about the people and nations when they are confronted by a crisis. The USSR broke up while she was writing about it, but that didn't faze her. She loved visiting the former soviet republics. She was so excited by the spirit of glasnost (openness) in the early days. Let's demand glasnost all around. I previously wrote about this quake here. Click on the Environmental Hazards tag for more posts about earthquakes, other environmental hazards and disaster preparedness. The jet stream almost exactly traced the coastline today, not a typical pattern for us. 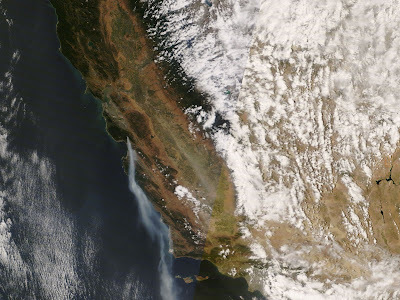 The Santa Cruz mountains wildfire injected a plume of smoke into the middle of the jet stream. My sister says that there was no way I could have been feeling the effects of the smoke from the Santa Cruz fire by 8:30 AM when we IM'd. Jet stream speeds of 120-150 knots could travel between Santa Cruz and LA in 3 hours or so. The fire started around 5:30 AM. She's right. But what could it be? Perhaps I was experiencing respiratory effects from the Santa Clarita fire closer to home? Santa Clarita is NE of me; the smoke from that fire is unlikely to travel this far west. It was such a small fire compared to the Santa Cruz one. After discussion with my sister, I realized that the unusual wind pattern put me downwind of the Chevron refinery 5 miles NE of home. It rained between 6 and 7 PM today and it sounds like the rain has started up again. Rain in late May in a non-El Nino year is rare. Could the soot from the fire have nucleated raindrops? If you explore the FreeRangeKids link from my last post, you might have seen How children lost the right to roam in 4 generations. This graphic is especially telling. Remember the mom that let her 9 year old take the NYC subway alone? 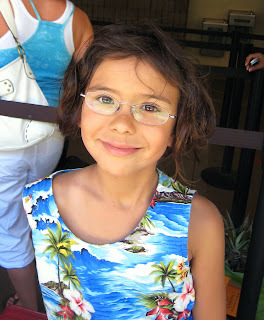 Lenore Skenazy started a movement and a blog. Go visit the FreeRangeKids blog. Today is the second let her walk to school by herself Tuesday. Last Tuesday, I was running behind and let her walk to school while I finished the dishes. I was going to catch up with her, but discovered she was doing just fine. I hung back to give her the satisfaction of making the whole 3 blocks to school on her own. Today, I ate a bit slowly so I could use the same excuse. I caught up with her in front of her classroom. She was positively nonchalant about it today. I watched with smug satisfaction as a neighbor struggled to strap 2 of her 3 kids up in her minivan, both older than Iris, to drive them to the same neighborhood school. We live on a one-way street, pointed away from the school. She lives a block closer to school, only 2 blocks to our 3. Yet, because of the one-way street, she has to drive farther to get the kids to school. I offered to walk her kids to school with me, but she declined. One boy used to be driven every day by his mother while she was rushing off to work. It was silly because we departed and arrived at the school at the same time. We offered to walk him with us each day, but he declined. His mother said it was because he was too cool to be seen walking with such a little kid (Iris). I noticed that, now that he is in the 5th grade, he is allowed to ride his bike or scooter to school each day on his own. Another boy on our block also gets driven every day, even though the father says he would be happy to walk his son to school. His said that his wife wouldn't allow them to walk for some reason. We leave at the same time, but we arrive before them. Again, they live closer but drive further because of the one way street. We used to walk with another mother and child, but the mother had to stop due to health reasons. Hopefully, she will be walking again after her illness. Now guess which family is Black, Chinese, Hispanic and Jewish. A follow up to the thread, Homework plagiarism, Homework détente, Homework détente 2 and Open House. Iris finished the satellite model and the first draft of the report last weekend with us riding herd, but not doing the project for her. At first, she wanted to make a satellite that would save our planet from global warming, a giant umbrella of some sort. I could have just let her turn in her umbrella and world globe and let her be done with it, but I talked her out of it. As commentator Eric C. mentioned, it would have been better to ask Socratic questions. But she doesn't have any clue about the complexity and energy expenditure to put a giant umbrella in space. I told her that it had been suggested before and rejected as impractical. Fortunately, she had seen Spy Kids 1-3 the weekend before that. (Don't ask why we let her watch so much TV that weekend.) The satellite section of the library was cleaned out, but the spy section contained 2 books (1 a gem) about spy satellites. She was hooked. She started with a shoe box, but abandoned that for an IKEA desk organizer box with a lid. She found a little plastic snack box and some cardboard in the craft room and constructed a "camera". She covered it in foil while I covered the bigger box with foil. The foil represents solar photovotaic cells. I showed her how to create a hinge with clear package tape. She made the rest of the hinges. With the globe, I showed her how the satellite has to store energy to operate in earth's shadow. She remembered the batteries in the clock she took apart last month and quickly ran downstairs for 2 AA batteries from our e-waste box. She taped them inside her spacecraft, with the battery ends touching a foil-covered part of the camera. (She was very proud that she observed and remembered that batteries need a metal contact.) She had both positive ends touching the camera and I showed her how batteries are usually alternated +/-. She made the change. Mark printed out a 60's style space logo which she cut out and glued to the side. She told me that she could make a model of the plane that catches the film canisters that drop out the trap door of her satellite, but that would be showing off. No, she would not show off. She is done with her project. Not so fast, she needs to rewrite the final draft in cursive. Anyway, I periodically browse Trends in Japan; I like to look at the rampant creativity in the Street Style slide shows. 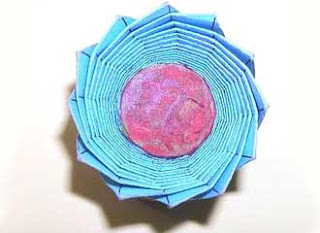 Serendipitously, the top link on the main page goes to The Science of Origami. What should I see but a folded satellite antenna? (Photo courtesy of Dr. Nojima Taketoshi) You pull opposite sides of the piece and the antenna blooms before your eyes, all while maintaining a steady center of gravity! Magical. 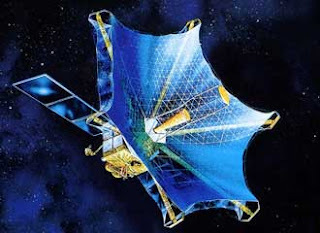 An artist's conception of the antenna in space. Some people have noticed the lack of knitting and sewing content lately. It's partly due to an arthritis flare-up. I came down with an infection and my joints swelled up so badly, I gained 2 pounds overnight. Basic activities became so difficult, I cut down on my non-core activities. (But, perhaps, I should reclassify creative pursuits as core activities?) It got so bad that I restarted physical therapy again. I used to go to a PT 7.5 miles away from work; my home is halfway between the hospital/my network of doctors and workplace. 7.5 miles doesn't sound like much, but it can take 45 minutes during commute hours--and I try to book my appointments before or after my workday which means the traffic is always bad. The old place was fine, but all that running around 2-3x per week was adding to my stress. This time, I decided to try a new place that opened up on my way to work. It is less than 5 minutes from either work or home. My rheumatologist said that he had another patient who went there and had a very positive experience. I am so glad I made the switch. Today's session was very different from anything I have ever experienced in 20 years of (off and on) PT. The PT I met today is trained in the Feldenkrais Method. He asked me what kind of things I have problems with. I replied, "Getting out of bed, in and out of chairs, and sitting for long periods of time." He asked me to show him how I get out of bed. I complied. Did you know there is a right and wrong way to get out of bed? (He never said that I did anything wrong; he asked if I would like to learn an easier way.) I had never given rolling out of bed much thought before. But, after he explained the easier method and the bio-mechanical reasoning behind it, I got it immediately. So, if you asked me why I was late getting to work today, I could honestly say that I was practicing getting in and out of bed. Excuse me, I have to go practice see-saw breathing, alternating belly breathing with chest breathing. Apparently, most people have difficulty with the former but not the latter. I have no trouble with belly breathing, but have very little range of motion in my rib cage. We think it has something to do with the ribs I cracked in a mountain biking accident, trying to keep up with the Boulder chapter of WOMBATS (Women's Mountain Biking And Tea Society). That's a whole 'nother story. It is hard to get out of The Most Beautiful Bed in the Whole World, but one must. I've been looking at horrific pictures of pancaked school buildings in Sichuan Province and small corpses. The magnitude of the death toll in Sichuan and Burma is hard to fathom. James Fallows does an excellent job, putting people and faces to the numbers. Read Masses, and individuals, in China. The pictures of the kids in their classrooms and dormitories, before the quake, are heartbreaking. First I felt sad, now I am MAD. Why do schools so often collapse in earthquakes? Why are schools and hospitals deathtraps instead of havens in disasters? Andrew Revkin has been following the story. Read In Smart, Wealthy World, Schools Still Fall. Why?, Citizens Challenge China on Fallen Schools and Earthquake in China Highlights the Vulnerability of Schools in Many Countries. Follow the many fine links. The middle school where the largest group of kids was killed was a selective academy. Chengdu and the surrounding area had hung their hat on IT (information technology) as a way to pull themselves out of poverty. Computer world estimates that Chengdu is the 10th largest IT center globally. Many schools were built to train the next generation to move up the IT food chain. Kids competed for the right to leave their families and villages behind to live in crammed dormitories and attend huge classes in order to lift themselves and their families out of poverty. Look at the picture of a typical dormitory room on Fallows' blog. The 18 girls that shared that room had fewer possessions between them than what my daughter has in one corner of her room. Those girls had nothing but pluck, brains and willingness to work hard. What did the officials give them? Death traps. It's not just China according to Andrew Revkin. Experts on earthquake dangers have warned for years that tens of millions of students in thousands of schools, from Asia to the Americas, face similar risks, yet programs to reinforce existing schools or require that new ones be built to extra-sturdy standards are inconsistent, slow and inadequately financed. This is even true in western Canada and the United States. Why do we take care of kids and schools last (after prisons and pensions and medical services for the elderly)? Why is there money to fund shiny computer labs, but not basic safety? Andrew Revkin points to military spending as a place with plenty of money. Remember the bumper sticker, "Imagine a world where the schools have all the money they need and the Air Force has to hold bake sales"? I once attended a meeting at an Air Force Base which was interrupted at noon by the public address system. The announcements of bake sales benefiting this and that military (social and medical) need droned on for what seemed like 5 minutes. When it was over, I looked over at the colonel running the meeting and asked, "What was that about?" He said it was a daily occurrence. Great, now we are running bake sales to fund both our schools and our Air Force. There is no way we can ever bake enough. Following up on Homework détente and Homework plagiarism, Iris' year end third grade assignment makes me eat my words. She brought home multi-page instructions about the assignment. The teacher wants the kids to design and build a spacecraft from common household objects-no kits allowed. Furthermore, the kids need to write a report explaining the purpose of their spacecraft and how function determines form. The handout explained that parent participation is required for this assignment. The projects will be on display during the year end open house. This assignment just makes me ill, but not because I worry that Iris' project won't measure up. You see, her school is less than a mile from the birthplace of GPS. Our neighborhood had once been working class. But, starting in the 1970s after the first oil shocks, highly educated space industry workers have been moving into urban infill townhouses and condos within walking distance to their workplaces. The kids in her class go home to everything from section 8 apartments to million dollar townhouses. Their parents are as likely to be a PhD as a high school dropout. Is it really fair to assign spacecraft design as homework? Some of the parents design spacecraft professionally! How is everyone else going to compete with that? Additionally, the city library has been cleaned out of spacecraft books. Fortunately, the library at work is so good, historians petition for permission to use it for space race research. Now I understand why so many of my coworkers brought their kids in to the library during lunch. I'm dreading open house already. 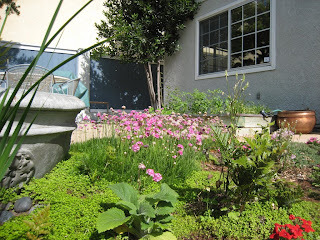 When we returned from Hawaii, our garden was abloom. The ignored epiyphyllum in the side yard. Yup, the blooms really are that large. 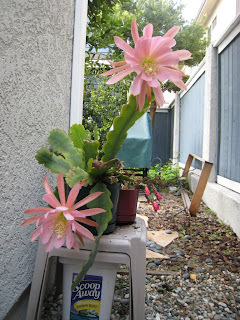 Read Call it orchid cactus or epiphyllum, it's a plant that hangs around in the LA Times. 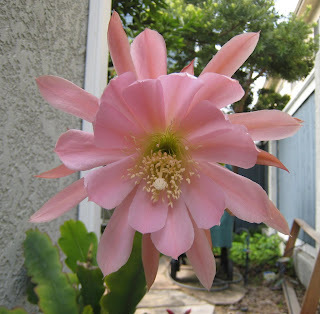 Rob named his blog, Are you cereus? after the plant. He also has a website with fantastic photography featuring epiphyllums. Don't miss it. The LA Times article mentions the difficulty of finding specimens for sale because they are rarely sold commercially. 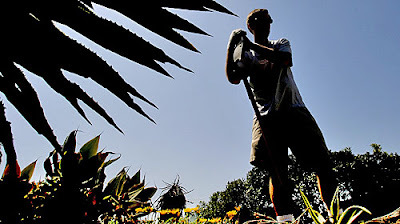 I bought mine at the Huntington Library Annual Plant Sale. Coincidentally, this year's sale is May 17-18, 2008. 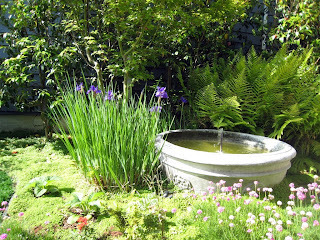 I am headed over there for members' only day (for the plant sale), May 17. Let me know if you want to come along as a guest. The rarest stuff goes the first day. The Japanese irises had popped open in our absence, too. The sea pink aka sea thrift are a bit past their prime. 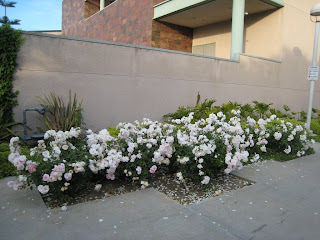 I love this bed of roses outside the Redondo Beach main library. They have just a hint of shell pink. 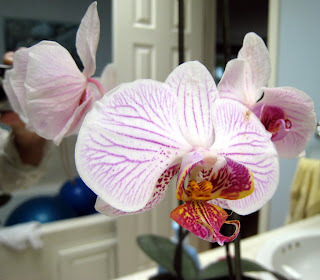 These orchids are 2 months past their prime, but still lovely. They look like they might be the same type Wandering Scientist showed in You're So Vein. Iris choose these orchids at Trader Joe's for mother's day. She made me pay for it, though. No need to adjust your monitor. 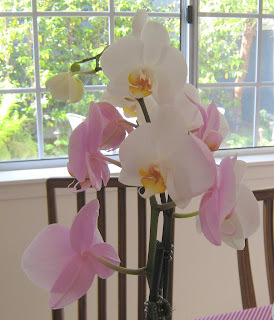 The pot contains TWO types of orchids, one white and one pink. Mark sent me this link and told me to rate myself. With only the first page to work with, there is no way to score higher than 25. I am doomed to be a very poor wife, indeed. 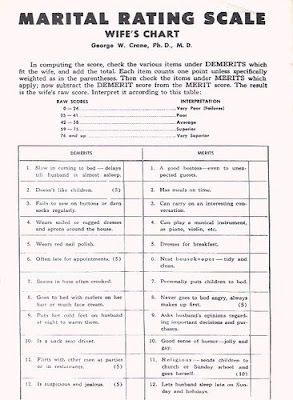 Tiabla posted the rest of the three-page test, along with the companion husbands' test. You can read more about the test in Husbands, rate your wives in the Monitor on Psychology. Better an average wife than a lame-duck spouse. The results are in and here's an excerpt from the press release. A big THANKS to Aerospace, Boeing, Electronic Arts, Equity Office / Howard Hughes Center, DirecTV, Los Angeles Air Force Base, Los Angeles World Airports, Northrop-Grumman, Playa Vista, and Raytheon for donating the awesome giveaways!!! Even though we lost, it was great to see a 25% year to year increase in bicycle commuters. Note also that LAAFB has 7000 employees and we have about a third as many. They beat us in raw numbers, but we have a higher percentage of bicycle commuters. We were saddened to see that ES major employer, Mattel, chose again not to participate. See you at the bike fair tomorrow and at the MTA Green Line Nash Station on Thursday morning! Media coverage of Bike-To-Work Week events in the South Bay has been sketchy again. Last year, I posted a schedule of Bike-To-Work Week events for 2007. Here's some info for Bike-To-Work Week 2008 in the El Segundo Employment Center area. The 8th Annual El Segundo Bike-To-Work Challenge will be held from 6 to 10 a.m. on Tuesday, May 13, in The Aerospace Corporation's Visitor Lot/Gate C located on Douglas Street, just south of El Segundo Boulevard. Many of El Segundo's employers will be competing for bragging rights (and a trophy) to see who can bring in the most bicycle commuters. Free continental breakfast, t-shirts and goodie bags* will be provided. There will be a bicycle and commuting expo outside the cafeteria at The Aerospace Corporation at lunchtime on Wednesday, May 14. MTA, AAA, commuter services and bike club members will be on hand to help you find a commute route using public transit, carpool/vanpool or bicycle. Several area bicycle shops will also be present with special deals for Bike to Work Week. * I have written before about how much I hate goodie bags, but this one actually contains good stuff. Last year, they gave out LED lights for commuting after dark! Maybe you are looking for a good used bike to use for bicycle commuting? You are in luck. As part of my stuff diet, I am selling two (out of 3.5) of my bicycles. Email me through my profile page for more info. I went to a fascinating exhibit in Denver in the mid 1990s about the Mayan civilization. One wall panel said that the two most honored ways to die were warriors in battle and women in childbirth. Why? Because both groups made the ultimate sacrifice in order to keep their civilization going. This mother’s day, instead of futzing around with whether federal employees should get paid maternity leave, let’s look at how our society treats mothers in general. Just for kicks, let’s compare how our nations treats our mothers and soldiers. Soldiers get paid. Mothers don’t. Soldiers get health and disability insurance. Mothers don’t1. Upon leaving the military, veterans get money for college. Mothers get nothing to help retrain them to reenter the paid workforce. Upon retirement, veterans receive medical care for life through the veteran’s administration. Mothers get nothing. Veterans receive a pension. Mothers do not. It doesn’t matter how many children she raised; she will get nothing3. So this mother’s day, skip the Hallmark cards, candy and flowers4. Do something substantive to show that MOTHERS COUNT. Send your mother wads of cash5. If she is “lucky” enough to have been married to a man (it has to be a man because marriage is a sacred relationship between a man and a woman) for 10 years or more, than she qualifies for a social security benefit half the size of his. This is available to any long-term spouse, regardless of the number of children. Therefore, this is a spousal benefit, not a maternity benefit. Her benefit is pegged to her spouse's, regardless of how hard she actually worked as a mother. Hence, someone who raised 5 children on a laborers wages, doing all the household work on her own (because she can’t afford help and her spouse is too tired after work to help), would get a fraction of the benefits that a billionaire’s spouse who has scads of household help would collect. They are imported anyways and they pulled out rainforests to put in those flower farms. Ann Crittenden worked out the numbers in The Price of Motherhood: Why the Most Important Job in the World is Still the Least Valued. I think we owe each mother a few hundred thousand dollars if you count the time value of money and throw in interest. I almost forgot about this one. Last February, when I flew on United, the serviceman in uniform next to me was bumped up to first class. The flight attendant told him that it was their policy, when empty seats were available in first or business class, to select servicemen/women in uniform. Hmm. What kind of mommy uniform will bump me up to first class? We missed our red-eye flight home Tuesday night because I didn't anticipate island time at the car rental return. United let us fly standby the following afternoon. It meant staying another night in paradise. Perhaps the universe was telling me that I had to learn a lesson about island time before I was ready to go home? Flights appeared easy to get when we booked, but the supply of seats between Hawaii and the mainland evaporated when Aloha Airlines and ATA Airlines both declared bankruptcy and ceased operations. We were lucky to get home the next day. So many people have been struggling to fly standby to the mainland, waiting for days. Several people stranded by Aloha told me that United sold them seats on short notice for only ~$50 more than Aloha charged for advanced notice fares. That was great for them, but it made my standby situation more dicey. Winners and losers, we all got home eventually. BTW, I heard that United flight attendants had low morale, but our flight crew behaved like troopers. When the plane (actually 2 planes, long story) was delayed for two hours due to mechanical problems, they waived their union rules and worked a very, very long day to get us home. Tag five people and acknowledge who tagged you. Unfortunately, there are only 4 sentences on page 123 of Alain de Botton's The Art of Travel. We cannot, of course, forbid such a thing; a pat on the back feels more appropriate. But our admiration for Humboldt's journey may not preclude our feeling a degree of sympathy for those who, even in the most fascinating cities, have occasionally been visited by a strong wish to remain in bed and take the next flight home. If I were to tag someone, I would select the Smart Bohemian because she lent me the book in the first place. Did I mention traveling with children is both delightful and aggravating? More on that later; my power cord died unexpectedly and I doubt I will be able to find a circa 2004 iBook power cable on this island. It will have to wait until I get home. Sunset over Lanai, as viewed from our lanai. Yesterday, Iris and I practiced snorkeling in the hotel pool. This morning, I took her to the beach to try snorkeling near a reef. While I was preoccupied with my own snorkeling equipment, Iris accidentally took off her snorkel valve. She found the soft silicone valve so compelling, she had to play with it, and squish it all around. Then it fell off and she asked what it was. I saw it in the sand, just as a wave took it away forever, into the Pacific. I hope a marine animal does not swallow it and die. She says it was an accident. But, the animal will be no less dead whether it was accidental or deliberate. Now we can discuss how the snorkel valve works. We went in anyways, Iris without her snorkel. We saw many colorful fish. And she repeatedly told me she loved me. After all, mommy showed her the underwater world. Daddy is working hard every night at the observatory at the top of the volcano. I forgot to mention, we are in Hawaii this week. *Correction: Iris says I got the incident all wrong. She says that she thought he squishy valve piece was a piece of get that did not belong there. So she removed it.